San Diego was the first site to be visited by Europeans on what is now the West Coast of the United States. Juan Cabrillo claimed the area for Spain after landing in San Diego Bay in 1542. Other leading industries in San Diego include tourism, manufacturing, bio-science, and high-tech. The topography of San Diego and San Diego County is quite diverse, boasting scenic canyons and mesas. On average, San Diego enjoys around 200 days out of the year where the temperatures top 70 degrees Fahrenheit. Since records have been kept, which covers about the last century and a half, snow in the city has only been recorded five times. San Diego is the second-largest city in California and the eighth-largest city in the entire United States. The county seat of eponymous San Diego County, it rests along the border of Mexico and is just 120 miles south of Los Angeles. Much like Los Angeles, San Diego is known for its idyllic weather. Both cities also boast delightful beaches. San Diego's are strung along nearly 70 miles of gorgeous coastline, and beach enthusiasts flock to them year round. Being that this is Southern California, surfing is a popular pasttime. When a break from the beach is in order, San Diego can keep you busy any other number of ways. The attractions in and around town are pleasantly diverse and cater to virtually all ages and interests. To give you a little background on San Diego, the city was founded in 1769 by the Spanish. It originally grew up around the Presidio of San Diego and the Mission San Diego de Alcala, both of which were established in 1769 and are now National Historic Landmarks. In 1850, San Diego was officially incorporated as a city. From there, it aspired to become Southern California's main metropolis. Los Angeles took the lead on that, however, due in part to the decision by the Santa Fe Railway to overlook San Diego and make L.A. the West Coast terminus of its transcontinental railroad instead. Most modern day San Diegans would likely tell you that they are glad that their city isn't quite as large or busy as Los Angeles. It just might be that losing out on the Santa Fe Railway terminus bid was the best thing to happen to San Diego in the long run, especially if you appreciate the city's rather laid-back appeal. San Diego attractions mix the old with the new and come in an impressive array of shapes and sizes. In the historic Old Town neighborhood, the Old Town San Diego State Historic Park welcomes those who are curious about San Diego history. The city's more modern downtown district, on the other hand, likes to show off its hypermodern architecture. Downtown San Diego is often referred to as New Town, and among its main draws is the Gaslamp Quarter. You can read more about this lively district in the following paragraph. Another highlight among the city-based attractions in San Diego is Balboa Park. Spread out over more than 1,000 acres, this enviable urban park offers gardens, walking paths, museums, theaters, gift shops, and restaurants. It is also home to the San Diego Zoo, which is unquestionably one of the most iconic San Diego attractions. No discussion about San Diego would be complete without also mentioning the area theme parks. 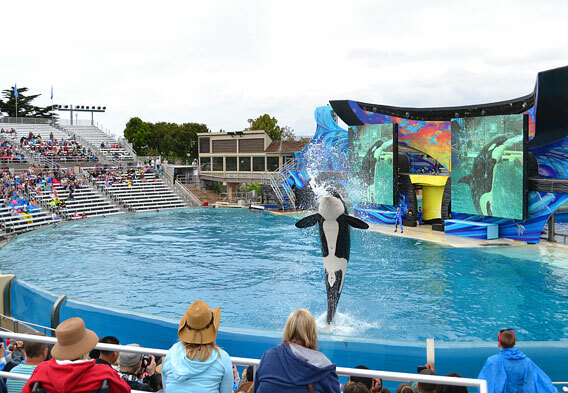 Prime examples include SeaWorld San Diego (pictured) and LEGOLAND California. As for the San Diego beaches, the very best are arguably found in the scenic and affluent La Jolla neighborhood. Beach enthusiasts will also want to target such hot spots as Imperial Beach and Coronado. A historic district that is listed on the National Register of Historic Places, San Diego's Gaslamp Quarter is a great place to explore. Covering nearly 20 downtown blocks, it offers plenty of turn-of-the-20th century appeal, not to mention an alluring mix of restaurants, shops, and bars. This is the definitive hub of nightlife in San Diego, and it is also where many of the city's best events and festivals are held. Examples of such events and festivals include Mardi Gras in the Gaslamp and the Street Scene Music Festival. As a side note, the Gaslamp Quarter offers close proximity to two other major San Diego attractions -- PETCO Park and Horton Plaza. PETCO Park is the home of the San Diego Padres and plays host to a variety of events. Horton Plaza is a renowned megamall that can keep shopping enthusiasts busy for hours on end. The San Diego waterfront figures among the city's main allures. Stretching for 34 miles, it features seven distinct areas and is dotted with shops, restaurants, hotels, marinas, parks, and other attractions. One of the main areas of the San Diego waterfront is the Embarcadero. 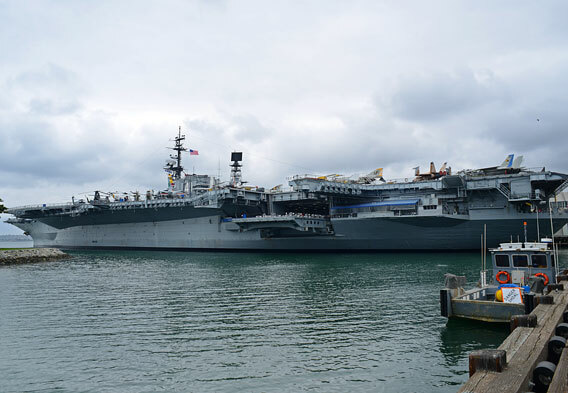 Found on the east side of San Diego Bay, this downtown area features many points of interest, including the city's cruise ship terminal, the USS Midway museum ship at Navy Pier (pictured), and the San Diego Maritime Museum. The other waterfront areas of San Diego include National City, Harbor Island, Shelter Island, Imperial Beach, Coronado, and Chula Vista. Each of these areas is a joy to explore and merits consideration when looking for things to do in San Diego. The San Diego hotels offer something to fit a wide range of tastes and budgets. Some are set along beaches, others in the desert, and there are plenty that offer world-class spas and golf courses. 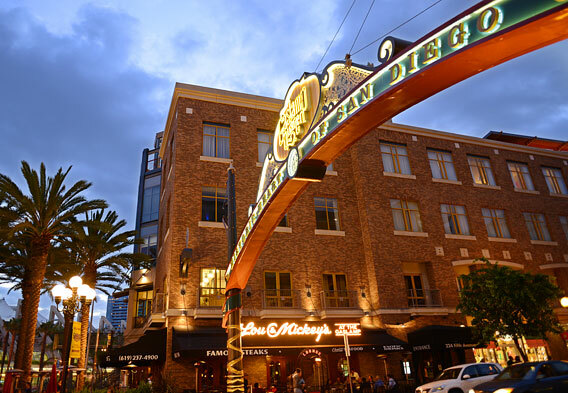 Downtown hotels are in good supply for those who want to be in the heart of the action, and as you might suspect, the Gaslamp Quarter is an especially popular place to stay. If your budget is tight, you should have little trouble finding a San Diego motel or backpacker hostel. For the bed and breakfast crowd, the city offers enticing B&Bs, some of which are delightfully out of the ordinary. Worth highlighting among the San Diego hotels is the Hotel del Coronado (pictured). 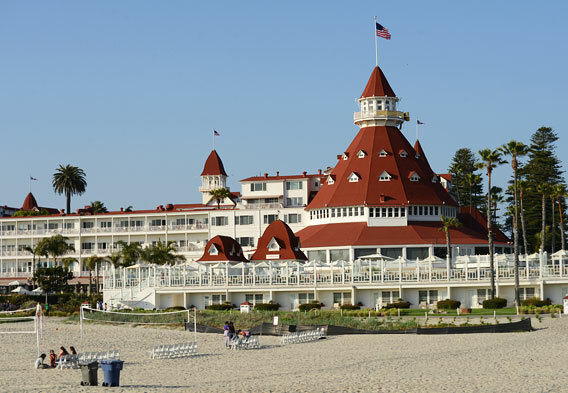 Found on the island of Coronado, which is really a peninsula, this historic gem of a luxury beach hotel is a verifiable San Diego landmark that has been welcoming guests since 1888.